This family home offers 3 bedrooms, 2 full bathrooms, (one with jetted tub), a fully equipped kitchen, dining room and a living room. The deck wraps around the south and west sides of the building and is partially enlcosed for dining and/or enjoying the spectacular views. 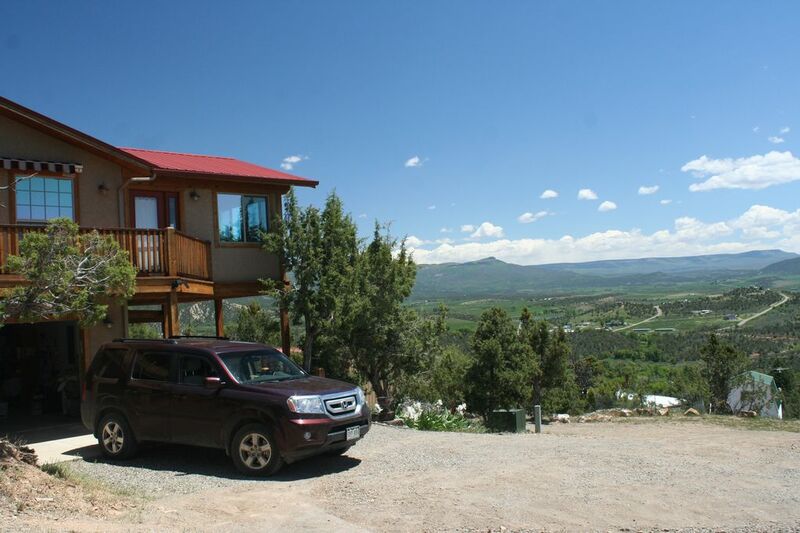 This guesthouse and retreat sits high above the quaint mountain community of Crawford, surrounded by pinion pines but open enough to watch the setting sun paint Mendicant Ridge (11,000 ft high). Miles of walking and hiking trails can be accessed from just outside the door. There is plenty to do: launch your boat, canoe, or kayak on Crawford State Park reservoir (2 miles away); visit local festivals, wineries, farm markets, and fruit orchards. Explore miles of back country roads and trails, by foot, mountain bike or jeep; or enjoy the peacefulness of nearby West elk Wilderness Area. Sleeps 4 to 6. Bed and bath linens, coffee and internet connection are provided. Television and landline telephone services are not provided. A 2 night minimum stay is required. Call to get weekly rates. Master suite with private bath has separate jetted tub and shower. Second bedroom has private bath with combination bath and shower. Separate room, also sitting area around island. The enclosed deck is set for dining,. Walt and Pam’s Place is a perfect get away to disconnect and enjoy endless vistas! Couldn’t have asked for anything more. Arrived in time to see a perfect sunset and John showed us around so we would be familiar with the Property. A feast for your senses doesn’t do it justice - what a perfect base camp to use for exploring the North Fork Valley and beyond. Will for sure be back the next time we’re in the Area if it’s available! We are from Nassau Bay Tx on a road trip through Co. We were so happy with this house we wish we could spend the rest of our trip right here. The house is very up to date, more spacious than i imagined and the view out each window, patio, and the deck were spectacular. The stars light up the sky at night. Very clean, beds are comfortable and the sunken jetted tub was a plus. The owners , Walt and Pam, were very friendly and available if needed. Thanks for sharing your place. Thank you. Such nice people! This house has a great view from almost every window. It's large, clean, and has an enclosed porch. Best of all is the jetted tub. Would work for at least 2 couples or a family. Very remote, and not too many places to eat, but the day rides are spectacular. The house is big and very well equipped. View is wonderful. What a great place to disconnect from the world. Beautiful home with a great view and lots of space to enjoy being with family. We had an amazing stay! Gorgeous house! Everything was clean.